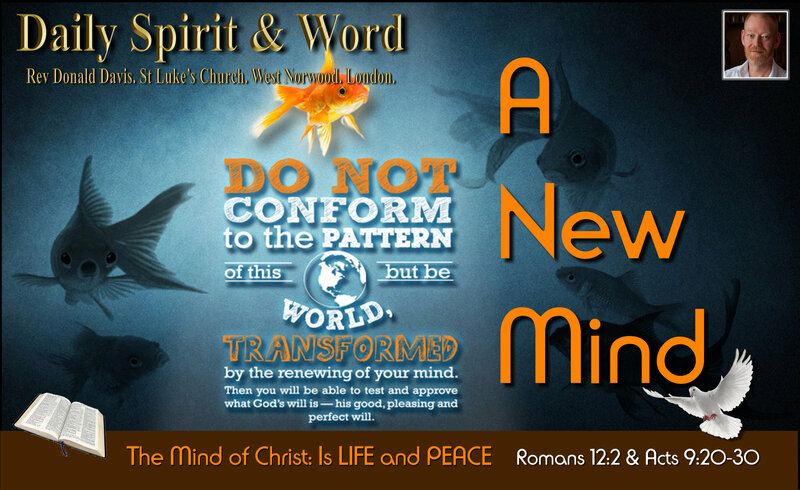 Daily Spirit & Word: 774: A Change of Mind. Good morning my friends, I know many of you have children on holiday from school and find it difficult to find time to read for long periods, so here’s a very short thought for today. We’ve probably all observed Goldfish in a tank, they swim in one direction, then suddenly all change direction and go another way. I love watching fish, but that’s what we need in this world, to be that one fish that suddenly turns and goes in another direction, perhaps the rest will follow. Decide today to follow Jesus. 20 At once he (Saul) began to preach in the synagogues that Jesus is the Son of God. We see this supremely in the life of St Paul (Saul) in the passage above. One day he’s spouting murderous thoughts and running around arresting and imprisoning Christians. A few days later he’s preaching the Gospel (The Good News of Jesus Christ FEARLESSLY). What brought about his complete change of mind? An encounter with the risen Lord Jesus Christ. WE NEED AN ENCOUNTER WITH JESUS. When we meet with Jesus, just like St Paul, our minds are going to be RENEWED. We’re going to begin to think like Jesus, because we too will receive the mind of Christ through the indwelling Holy Spirit. We too will begin to SPEAK UP for Jesus Christ. Romans 12:2 (NIV) Do not conform any longer to the pattern of this world, but be transformed by the renewing of your mind. Then you will be able to test and approve what God’s will is; his good, pleasing and perfect will. Then just like St Paul (Saul of Tarsus) we will be TRANSFORMED. Imagine being able to; test and approve what God’s will is? Imagine being able to know what His; good, pleasing and perfect will is? By His Holy Spirit, He’s making me like Jesus. Could you imagine going to Damascus today and proclaiming the Good News of the LORD Jesus Christ? They’d probably want to kill you too, just as the Jews did St Paul. However, he preached Jesus fearlessly, will we? Will we be so transformed by Jesus that in our place, where we live, we begin to speak up for Jesus? It’s a scary thought for many Christians, but that’s what the Holy Spirit in us will be prompting us to do. Let our minds be changed, renewed, growing every day, to become more and more like Jesus. P.S. Last night’s (27/7/2016) street evangelism was AWESOME! P.S. Once Paul was converted, he gained new enemies, they seemed to always want to take his life, to stop him preaching and proclaiming that Jesus is the Christ (Messiah), that Jesus is the Son of God (God), speaking boldly in the name of the Lord. As long as Paul was belonging to the world, the world loved him as one of it’s own. 24 If I had not done among them what no-one else did, they would not be guilty of sin. But now they have seen these miracles, and yet they have hated both me and my Father. 26 “When the Counsellor comes, whom I will send to you from the Father, the Spirit of truth who goes out from the Father, he will testify about me. My friends, as long as you belong to the world, the world will love you as one of it’s own, however: As soon as you are converted, as Paul was converted, the world hated him and it will hate you too, because you no longer belong to the world, you are not of this world, your new citizenship is in Heaven, you are a member of God’s household, you are His ambassadore to this world, you’ve become a new creature in Christ, you are now a Saint, this world is NOT your home any more. Satan: is the force behind all worldly efforts to silence the true Gospel of Jesus Christ: That men (mankind) are sinful, they’ve broken God’s commandments, without Christ there is no remedy for mankind’s sins, we cannot make ourselves clean and fit for heaven, because sin contaminates our souls, so the only way to be cleansed is by the blood of an innocent and pure sacrifice, something had to die in our place so that we could be saved. Jesus Christ, God’s one and only son is the full and sufficient sacrifice for the sins of all mankind. So that everyone who believes that He died for their sins, who repents of sin and trusts in Jesus’ death, will be SAVED. Now it’s no wonder that Satan and the world influenced by him, doesn’t want that message spread about too much. He’ll try and squash it, water it down, pervert and bend that message, so that as many as he can, he’ll take to hell with him. There’s nothing worse that whole hosts of people calling themselves ‘Christians’ who’ve never been born again or come to Christ, broken and guilty and confessing their sins. Satan loves it when the ‘church’ if filled with false-converts, filled and convinced they’re saved by a false or partial perverted Gospel message. The watered down Gospel is this; “Just believe in Jesus name, and ask him into your heart”; no reasons are given for why a person needs to come to Christ, no sin, no hell, no judgement, no repentance, no receiving Christ as LORD. That’s the false Gospel that many are believing today. They are NOT SAVED yet, but don’t give up, because they can be. However, my heart breaks at the thought of the countless thousands who’ll end up in hell, having believed and lived by this false Gospel message. Jesus died in order that many would be saved, let’s spread the true Gospel message and save as many as we can whilst there is still some time left before Jesus returns in Judgement. Amen! Previous PostPrevious Do You Want To Follow Jesus?